Third meeting of the Environment and Health Task Force. With the approach of the 2015 deadline for achieving 3 of the 5 commitments made at the 2010 Fifth Ministerial Conference on Environment and Health, 30 countries at the third meeting of the Environment and Health Task Force agreed to boost action to free Europe from asbestos-related diseases and exposure to second-hand tobacco smoke and toxic chemicals. 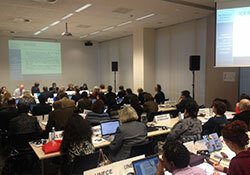 The meeting took place in Brussels, Belgium on 10–11 December 2013, hosted by the Belgian Government. While much progress has been made, environmental factors still account for 1 in 5 deaths in the WHO European Region. Participants in the Task Force meeting – representatives of countries, international organizations and civil society – decided that implementation needs to be scaled up in countries. It should focus on local action, keeping in mind the Parma commitments, which also include the need to provide safe water and sanitation, and safe environments for walking and cycling to each child by 2020. The participants acknowledged the European environment and health process as a solid platform to support the development of national action plans and inspire cooperation between sectors. A high-level meeting to be hosted by Israel in late 2014 will measure countries’ progress towards their pledges at the halfway point to the Sixth Ministerial Conference on Environment and Health in 2016. The participants at the December 2013 meeting established an ad-hoc working group to support the chair and co-chair of the Task Force in preparations for this midterm review. They also set up a working group on health and climate change to support the implementation of the European framework for action on climate change and health.